Associate Research fellow at IRIS, Sophie Lefeez is specialised in defence acquisition. Her research ranges from military requirement, threat analysis included, to design, use and support. It stands at the crossroad of economics, political science and sociology of technology. Since she gained her PhD in sociology of technology from the University of Paris 1 Pantheon-Sorbonne, she has offered consultancy to private companies, the French ministry of defence and has been working with Cranfield University on technology and procurement issues. She teaches sociology of innovation at Michel Serres Centre (Paris) and supervises theses at the French Joint Staff War College. 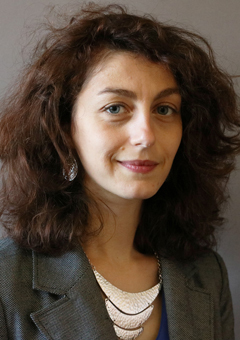 She was a founding member of AEGES (Association for War & Strategic Studies) in charge of public relations to the industry sector, and she acted as group leader for PhD students in economics and armament at IRSEM (Institute of Strategic Relations at Ecole Militaire), a group she joined at its creation in 2012.